This page is for help with downloading and playing the videos. These videos are designed to play in your browser. Just click on the play button, and the video will start to play. You can also download the videos via the download link below the videos. This can be useful if you have a slow internet connection and want to watch the videos locally on your device. If you experience any problems, please click here for a list of possible causes and solutions. Our paid videos are delivered in two ways. Depending on your course, you might receive them via email download links or via a membership site. If you receive your course via email, then the videos are meant to be downloaded to your computer so that you can watch them without internet access at any time. You will have a much better and easier viewing experience once the videos are downloaded. Here are some tips. Do not LEFT click on the video file link. Instead RIGHT click on it. If you LEFT click on the link, then in most cases the video will open in your browser and play there. You don’t want that! Why not? Therefore make sure to download the videos right away! Once they are downloaded, they will play perfectly – no delay, no loading, no dependence on internet. If your course is delivered in a membership site, the videos can either be viewed online from within your membership site, or they can be downloaded and viewed locally on your device. 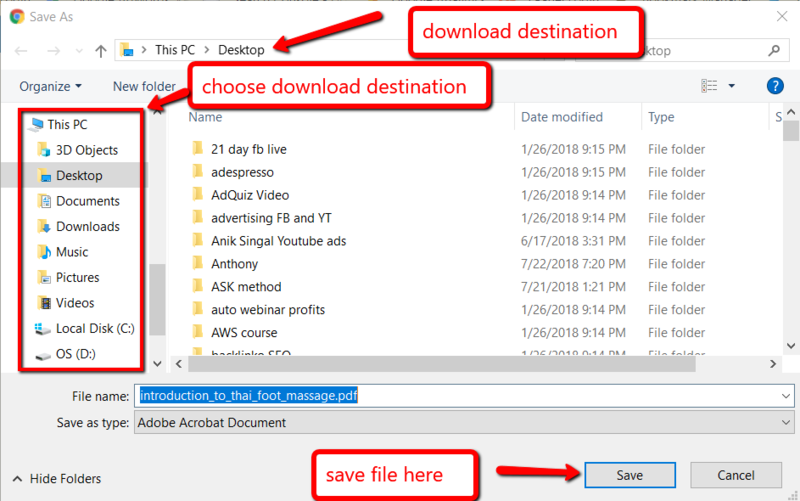 You click on a link, and the file starts to download right away. In this case you need to check where the file is being downloaded to. This depends on your browser settings. It will probably be the ‘download’ folder unless you have changed your browser settings. The file opens in a browser window. That’s what you DO NO WANT since your objective is to download it, not to play it in your browser. If you left-clicked on the file, try right-clicking instead. A popup box opens which lets you decide where you want the video to download to. That’s what you DO WANT to happen. Again this depends on what browser you are using. You might need to left-click or right-click to get the pop-up box to appear. In most cases right-clicking is the correct option, but not always. Unfortunately there is no one right way of doing this, since not all browsers or membership sites are configured in the same way. Try the left-clicking and the right-clicking – one of them will work. If the page gets messed up somehow, refresh the page to reset it. Problem: You did not download the video but are playing it in your browser. Your internet connection is probably slow. Solution: Download the video to your computer and watch it locally on your device. Problem: You downloaded the video to view it locally, but you are using a media player which is not compatible with the mp4 files that you are trying to play, or it is not configured correctly. Or you are using an old version of a media player which has not been updated for quite some time. Problem: You thought that you had downloaded the video. However the video did not download all the way. This can happen if there is a disruption in your internet connection during the download process. Solution: Download the video again. Here is how you can check that: Open the downloaded video file in VLC media player. Then grab the slider bar with your mouse and move it almost all the way to the right, to the end of the video. If no image shows up in the video, i.e. you just get a black screen, then the video has not downloaded all the way. Answer: If you are not familiar with downloading files, below is a video which will show you exactly how to do it. Please be aware that this is not an exact science. Operating systems (Mac, Windows etc) as well as browsers (Chrome, Firefox etc) all look a little different and may have different settings. 1. Clear cache and cookies in your browser, then close it and re-open it. If you don’t know how to do that, here is an article which explains how to do that. 2. Make sure that your browser is updated to the latest version. You will generally find an “update” link in the HELP section of the browser toolbar. 3. Use another browser. I suggest you download Chrome or Firefox. They are free and very easy to install. Many times something that did not work in one browser will work just fine in another browser. Here is the link to download Mozilla Firefox. Here is the link to download Google Chrome. 4. If an email download link is still not working after you tried all those things, try opening the email with the download link on another computer and start the download process. If it is working on another computer, then you know for sure that the problem is with your machine. 5. Server issues. A server is a huge computer which can host hundreds or thousands of websites. Servers are just machines. They do have problems sometimes, or they might be undergoing maintenance. In pretty much all cases those issues are fixed very quickly by the server administrators. But while there is such an issue going on, you might not be able to access a particular website. The server in question might be the one of your ISP (internet service provider), or the server of the fulfillment company which delivers our videos, or the server where the videos are hosted. Those courses which are delivered via a membership site can also be subjected to such a rare server outage. In the cyber world there is no such thing as perfection. Server outages are rare, but they can and do happen. In such a case there is nothing you or we can do except wait until the server is back to normal again. This is in most cases a matter of a few minutes, but in rare cases can take longer. What to do if you have a Mac and the videos only play in the browser, but do not download? Hold down the “control” key and at the same time click on the link. The video should download. Watch this download tutorial video for a step-by-step walk-through of the process. For best viewing, click on the wheel at the bottom right of the video (after it starts playing) and set the screen resolution to 720p. Then expand the video to watch it full screen.